I’m not as eloquent on the issue as Professor Daniel Lin, but I recently explained on Fox Business that government subsidies for higher education have enabled big increases in tuition, an outcome that has been good for bureaucrats and bad for students. In effect, this is simply a story of “third-party payer,” which happens when consumers get to buy something with other people’s money. Sellers respond by increasing prices since they know that consumers won’t care as much about price. Indeed, this is the main problem plaguing America’s health sector. Simply stated, government subsidies are a recipe for higher costs and inefficiency, regardless of the product or sector. We definitely see the bad consequences in higher education. Mitch Daniels, the head of Purdue University, correctly identifies the problem of third-party payer in a column for the Washington Post. …let’s design an economic sector guaranteed to cost too much. …we will sell a product deemed a necessity, with little or no option for the customer to avoid us altogether. Next, we will arrange to get paid for inputs, not outputs — how much we do, not how well we do it. We will make certain that actual results are difficult or impossible to measure with confidence. And we’ll layer on a pile of complex federal regulations to run up administrative costs. Then, and here’s the clincher, we will persuade the marketplace to flood our economic Eden with payments not from the user but from some third party. This will assure that the customer, insulated from true costs, will behave irrationally, often overconsuming and abandoning the consumerist judgment he practices at the grocery store or while Internet shopping. Presto! Guaranteed excessive spending, much of it staying in the pockets of the lucky producers. You say, “Oh, sure, this is American health care.” …Your answer is correct but incomplete. It worked so well in health care, we decided to repeat the formula with higher education. …by evading accountability for quality, regulating it heavily, and opening a hydrant of public subsidies in the form of government grants and loans, we have constructed another system of guaranteed overruns. It is the opposite of an accident that the only three pricing categories that have outpaced health care over recent decades are college tuition, room and board, and books. Daniels has done a great job controlling costs at Purdue, but I’m even more impressed that he is willing to look at the problems for our entire system of higher education (as such, I’ll forgive him for being the Budget Director during the big-spending Bush Administration). I especially like his solution, which in part would require colleges to repay taxpayers if there are loan defaults, thus ensuring that they have some skin in the game. …a promising movement is advancing in education to put some of the risk of lousy results — students who do not graduate or who graduate without having learned enough to earn their way in the world — on the institutions that “educated” them. It is about time. This game has been skinless far too long. …even a small degree of risk-sharing in higher education would cause significant behavior change. …Even a small charge, plus the embarrassment of its public announcement, would probably jar many schools from their complacent ruts. By the way, some people (including Paul Krugman) claim higher tuition is caused by budget cuts. Preston Cooper shared some of his research on this issue in the Wall Street Journal. A typical student in an American public college pays thousands of dollars more in tuition than just a decade ago. Students and parents are worried and frustrated, and many point the finger at state legislators… Hillary Clinton blamed “state disinvestment” in higher education for soaring tuition and declared her support for “free college.”While the “disinvestment” narrative is simple and appealing, it collapses under scrutiny. …Tuition goes up no matter what state legislators do. Public colleges, with state boundaries insulating them from competition, and generous federal student aid programs at their disposal, charge as much as they can get away with. Changes in state funding are largely irrelevant. He’s right about federal aid enabling higher tuition. Academic scholars have found a very clear link. Now let’s focus on the problem of ever-expanding bureaucracy. David Frum points out in the Atlantic that college bureaucracies have done a marvelous job of….drum roll…advancing the interests of college bureaucracies. One of the most famous essays on bureaucracy ever written was built upon a deceptively simple observation. Between 1914 and 1928, the number of ships in the British Navy declined by 67 percent. The ranks of officers and men shrank by 31 percent. But the number of Admiralty officials administering the shrunken force rose by 78 percent. …Here was the origin of Parkinson’s famous laws of bureaucracy, including “work expands to fill the time available” and “officials make work for each other.” …Why does college education cost so much? The Parkinson of American academia is Ralph Westfall, a professor at California Polytechnic University in Pomona. He computed in 2011 that over the 33 years from 1975 to 2008, the number of full-time faculty in the California state university system had barely increased at all: up from 11,614 to 12,019. Over the same period, the number of administrators had multiplied like little mushrooms: 3,000 had become 12,183. …with our universities. We’ve been thinking of them as institutions for teaching and learning—and wondering why we seem to be spending so much without achieving more. But if you think of them as institutions generating a perpetual cycle of employment in specialties for which there would otherwise be no demand at all? Why in that case, they are succeeding brilliantly. George Will, in a column about political correctness and campus snowflakes, shares this factoid about bureaucracy in California’s higher-education system. …over the last half-century, America’s universities have slowly been taken over by a burgeoning class of administrators and staffers who are less interested in training future entrepreneurs and thinkers as they are in turning institutions of learning into cash cows for a growing academic bureaucracy. …Every year, hosts of administrators and staffers are added to university payrolls, even as budget crises force schools to shrink their full-time faculties. There are armies of functionaries – vice presidents, associate vice presidents, assistant vice presidents, provosts, associate provosts, vice provosts, assistant provosts, deans, deanlets, and deanlings, each commanding staffers and assistants. In turn, the ranks of administrators have expanded at nearly twice the rate of the faculty, while administrative staffs have outgrown the academics by nearly a factor of five. 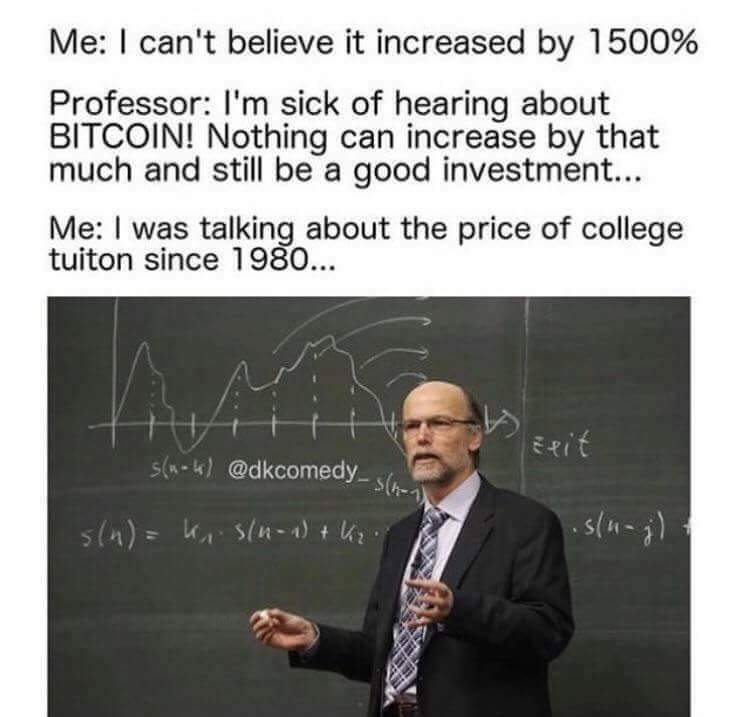 No wonder college is so expensive! Let’s close with this bit of satire from libertarian Reddit. P.S. You won’t be surprised to learn that Hillary Clinton, when looking for solutions to a problem caused by government subsidies, recommended even more government subsidies. America’s healthcare system is a mess, largely because government intervention (Medicare, Medicaid, Obamacare, and the tax code’s healthcare exclusion) have produced a system where consumers almost never directly pay for their medical services. This “third-party payer” system basically means market forces are absent. Consumers have very little reason to focus on cost, after all, if taxpayers or insurance companies are picking up the tab for nearly 90 percent of expenses. As a result, we get ever-higher prices. But we also get a lot of featherbedding and inefficiency because providers want to take advantage of this system. Athenahealth offered some sobering analysis on the system last year. The number of physicians in the United States grew 150 percent between 1975 and 2010, roughly in keeping with population growth, while the number of healthcare administrators increased 3,200 percent for the same time period. Yes, that’s 3,200 percent in 35 years…the growing number of administrators is…driven by…ever-more-complex regulations. (To cite just a few industry-disrupting regulations, consider the Prospective Payment System of 1983; the Health Insurance Portability & Accountability Act of 1996; and the Health Information Technology for Economic and Clinical Act of 2009.) Critics say the army of administrators does little to relieve the documentation burden on clinicians, while creating layers of high-salaried bureaucratic bloat in healthcare organizations. And here’s the chart that succinctly captures so much of what is wrong with America’s government-distorted healthcare regime. By the way, the chart implies that the rising number of administrators is driven by additional regulations from Washington. I certainly won’t disagree with the notion that more red tape is counterproductive, but I suspect that third-party payer is the primary cause of the problem. Third-party payer is what causes prices to climb, and then the government and insurance companies respond with various cost-control measures that require lots of paperwork and monitoring. Hence, more administrators. In other words, third-party payer is the problem and regulations and administrators are both symptoms. I’ll close by noting that I shared a version of this chart last year and warned that the numbers might be exaggerated. But there’s no question about the trend of more bureaucracy, red tape, and inefficiency. P.S. Because it’s so important to fix the third-party payer problem, I’ve actually defended one small provision of Obamacare. P.P.S. Here’s how genuine free markets result in lower costs for healthcare. That video included two charts based on my back-of-the envelope calculation, and I shared them in a 2013 column that further discussed the incremental damage of Obamacare. Our healthcare system as a mess before Obamacare. 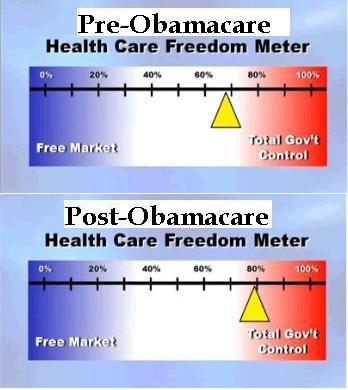 Normal market forces were crippled by government programs such as Medicare and Medicaid and also undermined by government intervention in the tax code that resulted in pervasive over-insurance that exacerbated the third-party payer problem. 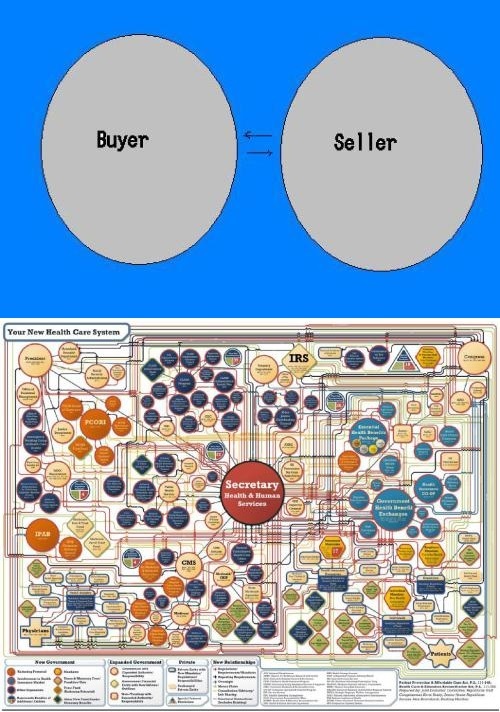 These various forms of intervention led to all sorts of problems, such as rising prices and indecipherable complexity…Obamacare was enacted in 2010, and it was perceived to be a paradigm-shifting change in the healthcare system, even though it was just another layer of bad policy on top of lots of other bad policy. …Not surprisingly, all of the same problems still exist, but now they’re exacerbated by the mistakes in Obamacare. In other words, we’re not going to fix the healthcare system by merely repealing Obamacare. Yes, that’s a necessary step, but much more needs to happen. Which is why I’m very happy that Prager University has a new video pointing out that health insurance doesn’t work nearly as well as car insurance and homeowners insurance. Why? Because it’s become an inefficient form of pre-paid health care rather than protection against large and unexpected expenses. Amen. I’ve made a similar case on several occasions. Though I wish the video went even further by explaining how the healthcare exclusion in the tax code encourages over-insurance. And here’s a video from the Foundation for Economic Education that also explains how government intervention is distorting the health market. Here’s the most important factoid from the video, which comes from the accompanying FEE article. According to the Consumer Price Index and Medical-care price index from 1935 to 2009, the health care spending crisis didn’t start until the mid 1960s, around the same time when Medicare and Medicaid were signed into law, and at the same time that we began requiring doctors to go through all sorts of expensive licensing procedures beyond medical school. Since then, health care spending has doubled, even adjusted for inflation. But let’s keep everything in perspective. Our system is needlessly expensive and inefficient because of government, but it still manages to deliver some decent outcomes. Here is some very interesting analysis from the Adam Smith Institute in London. US healthcare is famous for…poor outcomes. …their overall outcome on the most important variable—overall life expectancy—is fairly poor. I get this factoid thrown in my face repeatedly when speaking overseas, so I was delighted to find out that it has nothing to do with the quality of our healthcare. …consider the main two ingredients that go into health outcomes. One is health, and the other is treatment. If latent health is the same across the Western world, we can presume that any differences come from differences in treatment. But this is simply not the case. Obesity is far higher in the USA than in any other major developed country. Obviously it is a public health problem, but it’s unrealistic to blame it on the US system of paying for doctors, administrators, hospitals, equipment and drugs. In fact in the US case it’s not even obesity, or indeed their greater pre-existing disease burden, that is doing most of the work in dragging their life expectancy down; it’s accidental and violent deaths. It is tragic that the US is so dangerous, but it’s not the fault of the healthcare system; indeed, it’s an extra burden that US healthcare spending must bear. Indeed, it turns out that the American system produces very good results on life expectancy once you adjust for these behavioral factors. 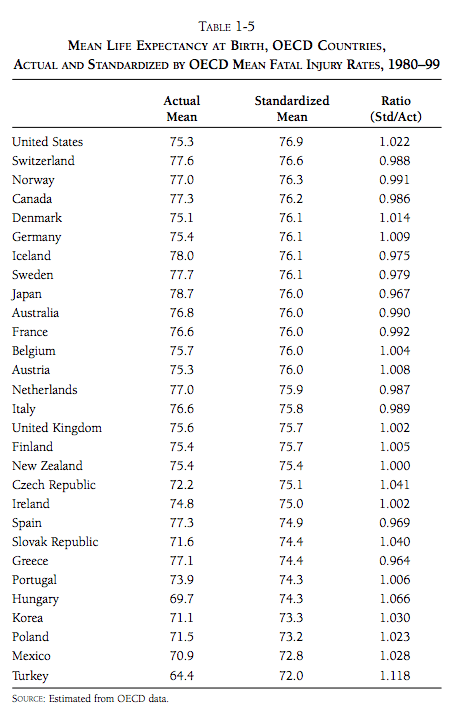 …simply normalising for violent and accidental death puts the USA right to the top of the life expectancy rankings. And here’s the relevant chart from the article. By the way, health spending in the United States would probably be high compared to other nations even if we removed all government intervention and changed our risky behaviors. …viewed through the lens of consumption behavior, American health-care spending is typical of this nation’s habits and mores. Relative to GDP, Americans consume a lot more than Europeans, and our health-care spending is another example of that tendency. …Consumption in the U.S., per capita, measures about 50 percent higher than in the European Union. American individuals command more resources than people in countries such as Norway or Luxembourg, which have higher per capita GDP. The same American consumption advantage is evident if you look at dwelling space per person or the number of appliances in a typical home. …To put it most simply, we Americans spend a lot on health care because we spend a lot period. Tyler includes a graph mapping healthcare expenditures with overall consumption. 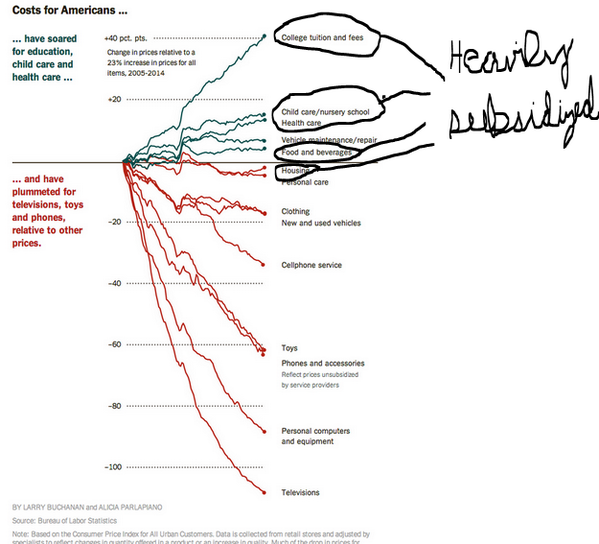 The basic takeaway is that what makes America an outlier is our ability to consume, with healthcare being an example. So what’s all this mean for policy? Peter Suderman offers some very sage advice in a column for the New York Times. …when it comes to health care, Republicans don’t know what they want, much less how to get it. …Democrats, on the other hand, share a distinct vision of robust universal coverage guaranteed by the government and paid for by a combination of delivery-system efficiencies and higher taxes. What Republicans need, then, is a set of guiding principles — a health care vision that should work from the ground up, that imagines a more affordable and more effective system. Peter then suggests some principles. …it would mean giving up on comprehensive universal coverage. Otherwise, Republicans will just end up bargaining on the terms set by Democrats, as they are now. …a second principle: unification, not fragmentation. …employer-provided coverage…is subsidized implicitly through the tax code, which does not tax health benefits provided by employers as income. This tax break is the original sin of the United States health care system. Worth more than $250 billion annually, it has enormously distorted the market, creating an incentive for employers to provide ever-more-generous insurance while insulating individuals from the true cost of care. …the third principle comes in: Health coverage is not the same as health care. Instead, it is a financial product, a backstop against financial ruin. Health care policy should treat it as one. …For noncatastrophic, nonemergency medical expenses, Republicans ought to promote affordability rather than subsidies. …encourage supply-side innovations in addition to demand-side reforms. The tangle of regulations governing health care can make it difficult for providers to respond to market signals and innovate. Doctor-owned hospitals are restricted by law, for example, and certificate-of-need requirements force medical providers to obtain licenses in a process that effectively requires them to ask permission from competitors to expand. In other words, we wind up this column where we started. Americans get good health care, but it’s needlessly expensive and inefficient as I explained in Part I and Part II of a recent series. If we can somehow unravel, or even bypass, all the bad government policy that currently exists, we could have a much better system. How much better? Well, check out this Reason video on a free-market health center in Oklahoma, which recently was featured in a story in Time. Based on my personal experiences, that’s a big step in the right direction. Back in 2015, I basically applauded the Congressional Budget Office for its analysis of what would happen if Obamacare was repealed. The agency’s number crunchers didn’t get it exactly right, but they actually took important steps and produced numbers showing how the law was hurting taxpayers and the economy. Now we have a new set of Obamacare numbers from CBO based on the partial repeal bill approved by the House of Representatives. The good news is that the bureaucrats show substantial fiscal benefits. There would be a significant reduction in the burden of spending and taxation. But the CBO did not show very favorable numbers in other areas, most notably when it said that 23 million additional people would be uninsured if the legislation was enacted. Part of the problem is that Republicans aren’t actually repealing Obamacare. Many of the regulations that drive up the cost of health insurance are left in place. My colleague at Cato, Michael Cannon, explains why this is a big mistake. Rather than do what their supporters sent them to Washington to do – repeal ObamaCare and replace it with free-market reforms – House Republicans are pushing a bill that will increase health-insurance premiums, make health insurance worse for the sick… ObamaCare’s core provisions are the “community rating” price controls and other regulations that (supposedly) end discrimination against patients with preexisting conditions. …Community rating is the reason former president Bill Clinton called ObamaCare “the craziest thing in the world” where Americans “wind up with their premiums doubled and their coverage cut in half.” Community rating is why women age 55 to 64 have seen the highest premium increases under ObamaCare. It is the principal reason ObamaCare has caused overall premiums to double in just four years. Community rating literally penalizes quality coverage for the sick… ObamaCare is community rating. The AHCA does not repeal community rating. Therefore, the AHCA does not repeal ObamaCare. It would be ideal if Republicans fully repealed Obamacare. Heck, they should also address the other programs and policies that have messed up America’s healthcare system and caused a third-party payer crisis. That means further reforms to Medicaid, as well as Medicare and the tax code’s exclusion of fringe benefits. But maybe that’s hoping for too much since many Republicans are squeamish about supporting even a watered-down proposal to modify Obamacare. That being said, there are some reasonable complaints that CBO overstated the impact of the GOP bill. Doug Badger and Grace Marie Turner, for instance, were not impressed by CBO’s methodology. The Congressional Budget Office (CBO) launched its latest mistaken Obamacare-related estimate this week, predicting that a House-passed bill to repeal and replace the embattled law would lead to 23 million more uninsured people by 2026. 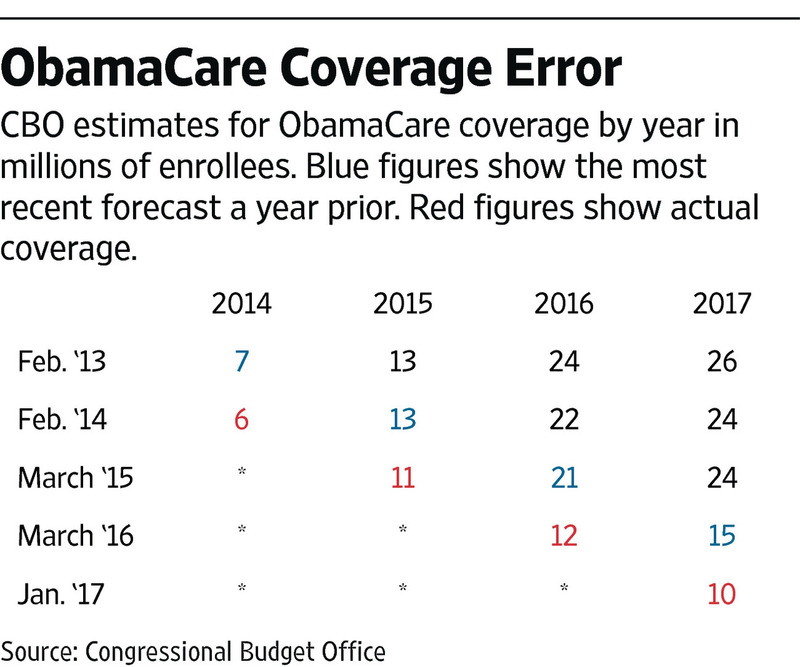 …the agency’s errors are not only massive – one of their predictions of 2016 exchange-based enrollment missed by 140%… Undaunted by failure and unschooled by experience, CBO soldiers on, fearlessly predicting that millions will flock to the exchanges any day now. 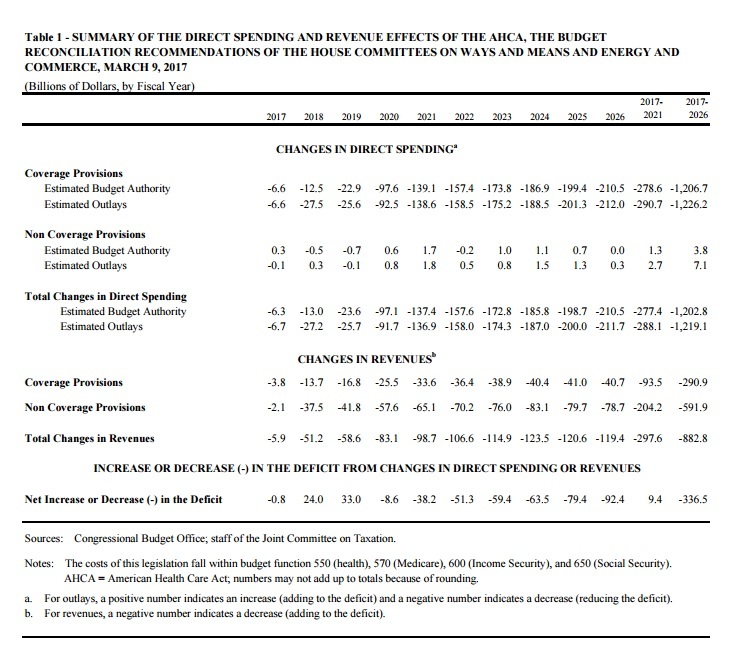 …CBO measures the House-passed bill against this imaginary baseline and finds it wanting. …One reason CBO gets it so wrong so consistently is its fervent belief that the individual mandate has motivated millions to enroll in coverage. …CBO’s belief in the power of the individual mandate is misplaced. …The IRS reports that in the 2015 tax year, 6.5 million uninsured filers paid the tax penalty, 12.7 million got an exemption and additional 4.2 million people simply ignored the penalty. They left line 61 on their form 1040 blank, refusing to tell the government whether or not they had insurance. …In all, that is a total of 23.4 million uninsured people – out of an estimated 28.8 million uninsured – who either paid, avoided or ignored the penalty. That hardly suggests that the mandate has worked. The Wall Street Journal also was quite critical of the CBO analysis. …the budget scorekeepers claim the House bill could degrade the quality of insurance. This editorializing could use some scrutiny. Without government supervision of insurance minutiae and a mandate to buy coverage or pay a penalty, CBO asserts, “a few million” people will turn to insurance that falls short of the “widely accepted definition” of “a comprehensive major medical policy.” They might select certain forms of coverage that Obama Care banned, like “mini-med” plans with low costs and low benefits. Or they might select indemnity plans that pay a fixed-dollar amount per day for illness or hospitalization, or dental-only or vision-only single-service plans. CBO decided to classify these people as “uninsured,” though without identifying who accepts ObamaCare’s definition of standardized health benefits and why they deserve to substitute their judgment for the choices of individual consumers. …But the strangest part of CBO’s preoccupation with “high-cost medical events” is that the analysts never once mention catastrophic coverage—not once. These types of plans didn’t cover routine medical expenses but they did protect consumers against, well, a high-cost medical event like an accident or the diagnosis of a serious illness. Those plans answered what most people want most out of insurance—financial security and a guarantee that they won’t be bankrupted by cancer or a distracted bus driver. …under the House reform Americans won’t have any problem insuring against a bad health event, even if CBO won’t admit it. …CBO has become a fear factory because it prefers having government decide for everybody. Drawing on his first-hand knowledge, Dr. Marc Siegel wrote on the issue for Fox News. …23 million…will lose their health insurance by 2026 if the American Health Care Act, the bill the House passed to replace ObamaCare, is passed in the Senate and signed by President Trump. This number is concerning — until you look at it and the CBO’s handling of the health care bills more closely. …First, the CBO was wildly inaccurate when it came to ObamaCare, predicting that 23 million people would be getting policies via the exchanges by 2016. The actual number ended up being only 10.4 million… Second, many who chose to buy insurance on the exchanges did so only because they wanted to avoid paying the penalty, not because they needed or wanted the insurance. Many didn’t buy insurance until they got sick. The Oklahoman panned the CBO’s calculations. IN the real world, people who don’t have insurance coverage cannot lose it. Yet…the CBO estimates 14 million fewer people will have coverage in 2018 if the House bill is enacted than would be the case if the ACA is left intact, and 23 million fewer by 2026. …In 2016, there were roughly 10 million people obtaining insurance through an Obamacare exchange. The CBO estimated that number would suddenly surge to 18 million by 2018 if the law was left intact, but that far fewer people would be covered if the House reforms became law. Put simply, the CBO estimated that millions of people who don’t have insurance through an exchange today would “lose” coverage they would otherwise obtain next year. That’s doubtful. …At one point, the office estimated 22 million people would receive insurance through an Obamacare exchange by 2016. As already noted, the actual figure was less than half that. One major reason for the CBO being so far off the mark is that federal forecasters believed Obamacare’s individual mandate would cause people to buy insurance, regardless of cost. That hasn’t proven true. …In a nutshell, the CBO predicts reform would cause millions to lose coverage they don’t now have, and that millions more would eagerly reject the coverage they do have because it’s such a bad deal. Those aren’t conclusions that bolster the case for Obamacare. And here are passages from another WSJ editorial. CBO says 14 million fewer people on net would be insured in 2018 relative to the ObamaCare status quo, rising to 23 million in 2026. The political left has defined this as “losing coverage.” But 14 million would roll off Medicaid as the program shifted to block grants, which is a mere 17% drop in enrollment after the ObamaCare expansion. The safety net would work better if it prioritized the poor and disabled with a somewhat lower number of able-bodied, working-age adults. The balance of beneficiaries “losing coverage” would not enroll in insurance, CBO says, “because the penalty for not having insurance would be eliminated.” In other words, without the threat of government to buy insurance or else pay a penalty, some people will conclude that ObamaCare coverage isn’t worth the price even with subsidies. …CBO’s projections about ObamaCare enrollment…were consistently too high and discredited by reality year after year. CBO is also generally wrong in the opposite direction about market-based reforms, such as the 2003 Medicare drug benefit whose costs the CBO badly overestimated. Here are excerpts from Seth Chandler’s Forbes column. My complaints about the CBO largely revolve around its dogged refusal to adjust its computations to the ever-more-apparent failings of the Affordable Care Act. When the CBO says that 23 million fewer people will have insurance coverage under the AHCA than under the ACA — a statistic that politics have converted into a mantra — that figure is predicated on an ACA that no longer exists. It is based on the continuing assumption that the ACA will have 18 million people enrolled on its exchanges in 2018 and that this situation will persist until 2026. I know no one on any side of the political spectrum who believes this to be true. The ACA has about 11 million people currently enrolled on its exchanges in 2017 and, with premiums going up, some insurers withdrawing from various markets, and the executive branch fuzzing up whether the individual mandate will actually be enforced. The consensus is that ACA enrollment will stay the same or go down, not increase 60%. And here’s some of what Drew Gonshorowski wrote for the Daily Signal. Last but not least, my former colleague Robert Moffit expressed concerns in a column for USA Today. The part that caught my eye was that CBO has a less-than-stellar track record on Obamacare projections. The GOP should be skeptical of CBO’s coverage estimates. It has been an abysmal performance. For example, CBO projected initially that 21 million persons would enroll in exchange plans in 2016. The actual enrollment: 11.5 million. The bottom line is that CBO overstated the benefits of Obamacare, at least as measured by the number of people who would sign up for the program. The bureaucrats were way off. Yet CBO continues to use those inaccurate numbers, creating a make-believe baseline that is then used to estimate a large number of uninsured people if the Republican bill is enacted. This is sort of like the “baseline math” that is used to measure supposed spending cuts when the budget actually is getting bigger. P.S. You may be wondering why Republicans don’t fully repeal Obamacare so that they can get credit for falling premiums. Part of the problem is that they are using “reconciliation” legislation that supposedly is limited to fiscal matters. In other words, you can’t repeal red tape and regulation. At least according to some observers. I think that’s silly since such interventions drive up the cost of health care, which obviously has an impact on the budget. Also, Republicans are a bit squeamish about reducing subsidies for various groups, whether explicit (like the Medicaid expansion) or implicit (like community rating). In other words, the Second Theorem of Government applies. Donald Trump wants the federal government to subsidize child care. If enacted, this policy is sure to increase costs and lead to inefficiency, just as similar types of intervention have caused problems in both healthcare and higher education. While Trump’s proposal is misguided, it hasn’t generated much surprise because politicians routinely try to buy votes with other people’s money. And I’m not the only one who is perplexed that someone at AEI is pushing one of Hillary Clinton’s favorite policies. In a comment on one of the AEI articles, a reader asks a very pointed question. Aparna Mathur, AEI’s Co-Directors of the Project, has an article responding to the question of whether intervention from Washington can be considered pro-freedom or pro-market. To her credit, she basically admits that the answer is no. I see your point that encouraging a federal paid family leave plan goes against the idea of limited government. …we don’t think markets are the end-all solution here… If we don’t intervene, then that’s how it’s going to continue. …I also agree with your point that this will be a burden on businesses. …we have to be open to the idea that in some areas, markets fail or may under-provide a benefit. And in those cases, for the larger good of society…, we need to accept some sharing of costs. But while she admits the policy is statist, she nonetheless justifies it because there ostensibly is a market failure. I’m temped to explain why this is nonsense. After all, the fact that we can’t have everything we want because of scarcity and trade-offs is one of the reasons market exist, not evidence of failure. But I don’t need to explain because one of Ms. Mathur’s colleagues already has done the job. Here’s some of what Benjamin Zycher wrote on this topic. There are no free lunches, and the mere fact that expanded paid leave in isolation would be very nice for some or many workers says little about the unavoidable tradeoffs. Would a given worker or group of workers prefer more such leave combined with lower explicit wages, or with fewer other nonwage benefits, or with employer demands for higher productivity? …with respect to the new moms returning to work soon after giving birth: Was that not their choice? Yes, in almost all cases, and it is not clear from Mathur’s discussion precisely why such costs ought to be “shared across society.” …Whatever “socializing the costs” comes to mean, it is inevitable that the proponents of such a policy, unconcerned with the expansion of government power, will demand that businesses give something up… So much again, for the free-lunch atmospherics: Such increases in costs will reduce employment… Which brings us to the final assertion: “In some areas, markets fail or may underprovide a benefit.” Wow. What does “underprovide” mean? …there are only two basic approaches to answering that question. The first: the outcomes emerging from competitive markets, in this case the amount of paid leave employers offer to employees and the amount that employees are willing to accept as part of total compensation, including working conditions defined broadly. Mathur simply rejects that outcome as too little. The second: Political determination of the appropriate amount of paid leave, in which majorities impose their will on everyone regardless of individual preferences. Why stop at paid leave? Why not have voters determine wages, vacation policies, dress codes, and everything else? And are voters really qualified to do so? I especially like Zycher’s final point. The notion that 51 percent of people should be able to dictate the terms of contracts to both employers and employees is offensive. Indeed, rejection of untrammeled majoritarianism was one of the main goals of America’s Founders when they put together the Constitution. And since we’re on the topic of majoritarianism, Professor Don Boudreaux explains that favorable opinion polls for mandated parental leave are both irrelevant and misleading. Of course that’s what the polls show – which is precisely why such polls are unreliable in cases such as this. We need take no polls to discover that people generally prefer to get benefits at a cost to them of nothing. Such ‘information’ is hardly newsworthy. …I want, for example, a brand new Mercedes-Maybach S600, but because I’m unwilling to pay the hefty price for the benefit that owning such a car would give to me, the correct conclusion is that I do not really want such a car given its cost. In other words, Boudreaux and Zycher both agree that there’s no free lunch. Paid leave, mandated by government, necessarily imposes a cost. And what’s really ironic about this issue is that some honest female analysts acknowledge that women will bear a lot of the cost. Simply stated, employers will provide them lower cash wages to offset the liability that is created by the government intervention. P.S. To the credit of AEI, it employs one of the nation’s best scholars on the faux issue of the gender pay gap (and you know it’s a fake issue because even Obama’s economic advisor dismissed the silly claim that markets deliberately overpay men). P.P.S. While I wish Ms. Mathur’s support for intervention was just an April Fool’s joke, at least I can share some intentional humor to celebrate the day. We know all about leftist hypocrites, and here’s another one to add to the list (h/t: Reddit). Needless to say, I’m not expecting Michael Moore to sell one of his many homes to help the poor, either. If you like April Fool’s Day humor, I shared some examples back in 2013. I’m flabbergasted when people assert that America’s costly and inefficient healthcare system is proof that free markets don’t work. In hopes of helping them understand what’s really going on, I try to explain to them that an unfettered market involves consumers and producers directly interacting with their own money in an open and competitive environment. I then explain why that’s not a description of the U.S. system. Not even close. 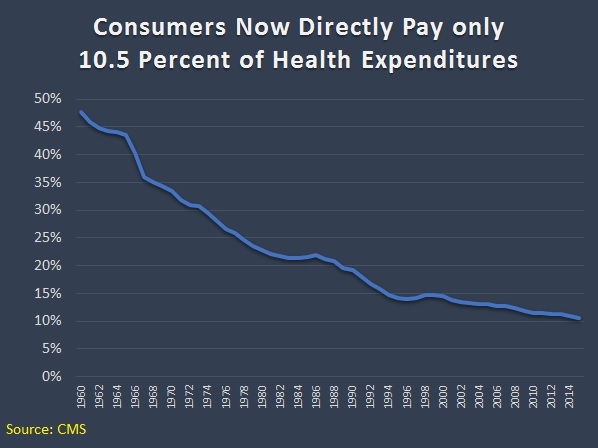 As I noted in Part I, consumers directly finance only 10.5 percent of their healthcare expenses. Everything else involves a third-party payer thanks to government interventions such as Medicare, Medicaid, the healthcare exclusion, the Veterans Administration, etc. Obamacare then added another layer of intervention to the existing mess. By my rough calculations, that costly boondoggle took the country from having a system that was 68-percent controlled and dictated by government to a system where government dictates and controls 79 percent of the system. This is very relevant because Republicans in Washington are now trying to “repeal and replace” Obamacare, but they’re confronting a very unpleasant reality. Undoing that legislation won’t create a stable, market-driven healthcare system. Instead, we’d only be back to where we were in 2010 – a system where government would still be the dominant player and market forces would be almost totally emasculated. The only difference is that Republicans would then get blamed for everything that goes wrong in the world of healthcare rather than Obama and the Democrats (and you better believe that’s a big part of the decision-making process on Capitol Hill). Yes, the GOP plan would save some money, which is laudable, but presumably the main goal is to have a sensible and sustainable healthcare system. And that’s not going to happen unless there’s some effort to somehow unravel the overall mess that’s been created by all the misguided government policies that have accumulated over many decades. This isn’t a new or brilliant observation. Milton Friedman wrote about how government-controlled healthcare leads to higher costs and lower quality back in 1977, but I can’t find an online version of that article, so let’s look at what he said in a 1978 speech to the Mayo Institute. I realize that many people won’t have 45 minutes of spare time to watch the entire video, so I’ll also provide some excerpts from a column Friedman wrote back in the early 1990s that makes the same points. He started by observing that bureaucratic systems have ever-rising costs combined with ever-declining output. …a study by Max Gammon…comparing input and output in the British socialized hospital system…found that input had increased sharply, while output had actually fallen. He was led to enunciate what he called “the theory of bureaucratic displacement.” In his words, in “a bureaucratic system . . . increase in expenditure will be matched by fall in production. . . . Such systems will act rather like `black holes,’ in the economic universe, simultaneously sucking in resources, and shrinking in terms of `emitted production. '” …concern about the rising cost of medical care, and of proposals to do something about it — most involving a further move toward the complete socialization of medicine — reminded me of the Gammon study and led me to investigate whether his law applied to U.S. health care. Friedman then noted how this bureaucratic rule operated in the United States after the healthcare exclusion was adopted during World War II. Even a casual glance at figures on input and output in U.S. hospitals indicates that Gammon’s law has been in full operation for U.S. hospitals since the end of World War II… Before 1940, input and output both rose, input somewhat more than output, presumably because of the introduction of more sophisticated and expensive treatment. The cost of hospital care per resident of the U.S., adjusted for inflation, rose from 1929 to 1940 at the rate of 5% per year; the number of occupied beds, at 2.4% a year. Cost per patient day, adjusted for inflation, rose only modestly. The situation was very different after the war. From 1946 to 1989, the number of beds per 1,000 population fell by more than one-half; the occupancy rate, by one-eighth. In sharp contrast, input skyrocketed. Hospital personnel per occupied bed multiplied nearly seven-fold and cost per patient day, adjusted for inflation, an astounding 26-fold. Friedman then explained that the adoption of Medicare and Medicaid hastened the erosion of market forces. One major engine of these changes was the enactment of Medicare and Medicaid in 1965. A mild rise in input was turned into a meteoric rise; a mild fall in output, into a rapid decline. …The federal government’s assumption of responsibility for hospital and medical care for the elderly and the poor provided a fresh pool of money, and there was no shortage of takers. Personnel per occupied bed, which had already doubled from 1946 to 1965, more than tripled from that level after 1965. Cost per patient day, which had already more than tripled from 1946 to 1965, multiplied a further eight-fold after 1965. 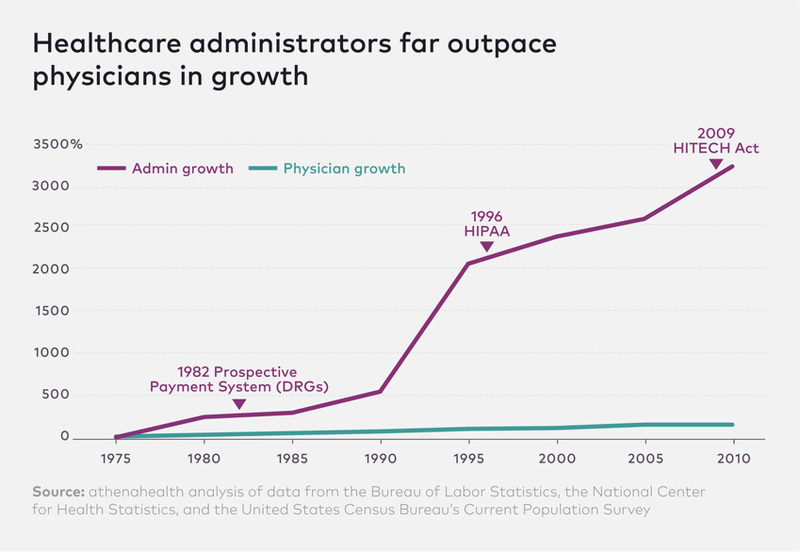 Growing costs, in turn, led to more regulation of hospitals, further increasing administrative expense. Remember, Friedman wrote this article back in 1991. And the underlying problems have gotten worse since that time. So what’s the bottom line? Friedman pointed out that the problem is too much government. The U.S. medical system has become in large part a socialist enterprise. Why should we be any better at socialism than the Soviets? And he explained that there’s only one genuine solution. The inefficiency, high cost and inequitable character of our medical system can be fundamentally remedied in only one way: by moving in the other direction, toward re-privatizing medical care. Some readers may be skeptical. Even though he cited lots of historical evidence, perhaps you’re thinking Friedman’s position is impractical. So let’s fast forward to 2017 and look at some very concrete data assembled by Mark Perry of the American Enterprise Institute. 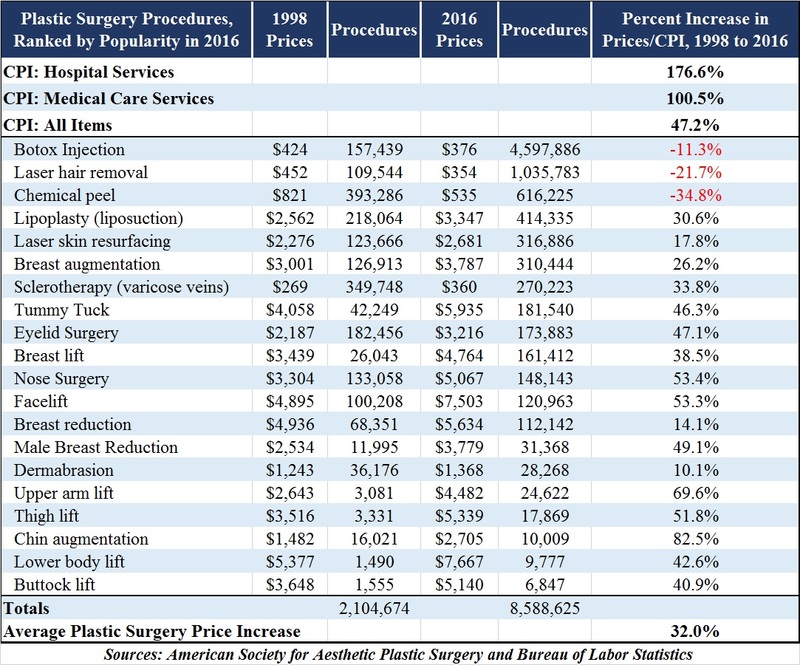 He looks at medical costs over the past 18 years and compares what’s happened with prices for things that are covered by third-party payer (either government or government-distorted private insurance) and prices for cosmetic procedures that are financed directly by consumers. 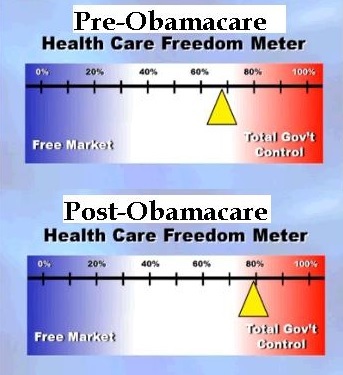 As you can see, the relative price of health care generally declines when people are spending their own money and operating in a genuine free market. But when there’s third-party payer, relative prices rise. Perry explains the issue very succinctly. Cosmetic procedures, unlike most medical services, are not usually covered by insurance. Patients paying 100% out-of-pocket for elective cosmetic procedures are cost-conscious, and have strong incentives to shop around and compare prices at the dozens of competing providers in any large city. Providers operate in a very competitive market with transparent pricing and therefore have incentives to provide cosmetic procedures at competitive prices. Those providers are also less burdened and encumbered by the bureaucratic paperwork that is typically involved with the provision of most standard medical care with third-party payments. Because of the price transparency and market competition that characterizes the market for cosmetic procedures, the prices of most cosmetic procedures have fallen in real terms since 1998, and some non-surgical procedures have even fallen in nominal dollars before adjusting for price changes. In all cases, cosmetic procedures have increased in price by far less than the 100.5% increase in the price of medical care services between 1998 and 2016 and the 176.6% increase in hospital services. In other words, a free market can work in healthcare. And it gives us falling prices and transparency rather than bureaucracy and inefficiency. Maybe when they’ve exhausted all other options, Republicans will decide to give freedom a try. P.S. If you want to get a flavor for how competition and markets generate better results, watch this Reason TV video and read these stories from Maine and North Carolina.